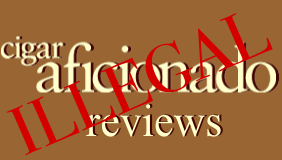 Stogie Commentary: Cigar Aficionado’s Reviews Are Illegal? Cigar Aficionado recently released a series of videos on their website about the process they use to review the dozens of cigars that are rated in every issue of the magazine. The problem is, under New York State law, every review is probably illegal. You see, cigars are usually smoked in their New York offices. They say they make a point of always smoking their cigars in the same place to ensure that the environment isn’t affecting the ratings. This is a problem because the New York State Clean Indoor Air Act (Public Health Law, Article 13-E) “prohibits smoking in virtually all workplaces.” Unlike an exemption-filled New York City law, the state law does include a few exemptions (including for “retail tobacco businesses” and “cigar bars”), but none that would seem to exempt a magazine’s office (unless the pages of CA are actually printed on paper made from tobacco, which would make the magazine a tobacco retailer). So, unfortunately, the facts are clear: Technically Cigar Aficionado is likely violating the New York State law. But as you might guess, my purpose in making this observation isn’t to get the magazine in trouble, but to show just how absurd anti-smoking laws are. The employees of Cigar Aficionado, many of whom are the ones doing the “illegal” smoking, clearly didn’t decide to work there to be in a smoke-free environment. In fact, the writers were chosen for their expertise in cigars, and Cigar Aficionado‘s employees all knew that they would be working in a smoke-filled environment. After all, the word “cigar” is right on the front door. In other words, there is no victim if and when Cigar Aficionado violates New York State’s smoking ban. Except that having a ridiculous, victimless law on the books diminishes public respect for laws in general. There won’t be—and shouldn’t be—anyone beating down Cigar Aficionado‘s doors to demand that they stop smoking. Here at StogieGuys.com, we regularly focus on smoking bans in bars, cigar lounges, and cigar parties, but workplace smoking bans are just as wrong. Surely most employers would, as they rightfully should be able to, ban smoking in the workplace. And that fact goes to show just how unnecessary and unfair workplace smoking bans are. Instead of letting freedom of choice work by allowing most places to ban smoking voluntarily, one-size-fits-all smoking bans are now affecting places where no reasonable person would ever suggest that smoking should be banned. Now let’s all light up a cigar in honor of violating unjust cigar bans everywhere! Everyone loves men and women that who post often, it's definitely really tough to get that particular understanding just about any way. First-rate job.